The best part about winter is the soup. Every year around this time, I get super excited to make different soups! There’s just something so comforting about them. They fill our home with beautiful, heart-warming aromas and often come together on those chilly weekend afternoons when I’m trying to relax and distract myself from work. Then they last the whole week. I think the two best things about making homemade soup is the ease and convenience. For most of the year, I tend to think homemade soup is just too much. Or I just can’t bring myself to make it. Once I start and get into the spirit, I am reminded just how easy homemade soup is to make. Not to mention the health benefits are amazing and the low cost of the ingredients definitely helps when we’re trying to stick our grocery budget. You really do get the most for your money. The benefits of cauliflower and chickpeas are pretty much endless. When I saw this recipe, I simply couldn’t ignore two of my favourite foods! Did you know that cauliflower contains 77 percent of your recommended daily dose of vitamin c?!?!?! It’s also a great source of vitamin B6 and potassium. Chickpeas are an excellent source of protein, so this soup is a fantastic option for vegetarians as well. When it comes down to it, this is a delicious, easy recipe you can make ahead of time and save in the fridge for on-the-go meals to get you through the week. And that’s probably the best part. Not only that, but and tastes great cold as well. It makes for a perfect lunch option. Try and let me know what you think! The full recipe is just below. Chop cauliflower into medium-sized pieces. 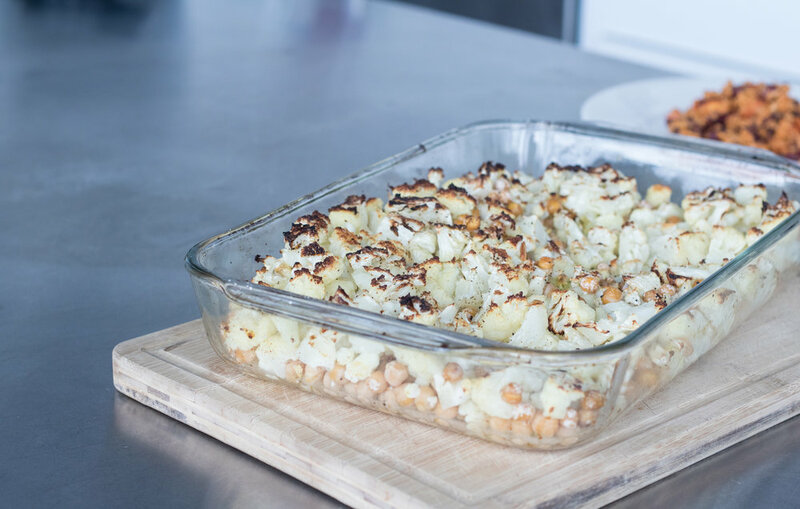 In an oven-safe pan, combine cauliflower pieces and 1 can of chickpeas. Drizzle olive oil over the mixture and shake the pan to distribute the oil evenly throughout. Add salt and pepper and a generous amount of garlic powder. Roast your cauliflower mixture until golden and remove from oven to let cool. Once the cauliflower mixture has completely cooled, transfer it to a blender, setting aside a small amount of the mixture for future garnish. Combine 1/2 cup of almond milk and 1/2 cup of vegetable broth and 1/2 cup of parmesan cheese into a large blender. From there, add 1 clove of fresh garlic and a handful of chopped green onion to the blender and blend on high for a few minutes. If your cauliflower mixture is too thick, simply continue adding small amounts of vegetable broth until you’ve reached your desired consistency. Serve your cauliflower soup into a bowl, and top with reserved roasted cauliflower and cheap peas. Follow up with a sprinkling of rosemary. Your soup is ready to be enjoyed!